Cirwen narrowed her eyes and glanced around the town, scanning both for the pub as well as a good place to "visit" later this evening - or tomorrow evening - once everyone was tucked away in their little beds. Gotta keep herself from getting rusty; it'd been a while since her last heist. But, even so, recently she'd been thirsting for a little bit more adventure in her life. Much of the thrill of her usual exploits had died down. And for a free-spirited individual who had given to a life of hedonism, this was unacceptable. Life was about profit, emotional or fiscal. And the emotional profit had begun to dwindle. Escaping her thoughts, she finds the pub where they were supposed to meet and headed inside. Adahlek was the maddest fellow she'd ever known, so this reunion would no doubt be entertaining. She approaches him from behind, quietly as possible, crumpled-up bit of parchment in hand and ready to be thrown. I should probably ask the bartender about those traitorous bastards, see if he knows anything. Or if that cheese on the counter is for sale. Focus! You came here to find answers, clues to where they might be. Huh, I feel like Cirwen should have been here by now. Where in Oblivion is she? You walk a lonely road, one of the many you've known that connect the cities you've been to. You've kept a little off to the side of the road, keeping an eye out for city guards. Up ahead on the road you hear hoofbeats. You figure by the sound of it, it's a single man on horseback. As he draws near, you see he's just a wanderer of some sort, and not a guard out on patrol. The rider wanders closer, gazing around at the scenery. Bart Ender found it a bit queer that a man he'd only just met had began calling him friend. It didn't bother him any though, he was a pleasant enough lizard. Looking at the Adahlek fellow, he caught him eyeing the cheese on the counter with a mad, lustful desire in his eyes. Another Sheogorath fool Bart thought. He didn't dare say it to the man's face though; he looked a tough, war-beaten sort of man, and people who worshiped Sheogorath were difficult. A man stood up from his place in a group in the corner of the pub, and made his way up to the bar at a brisk, merry pace "How much for this?" he asked, pointing at the block of cheese on the counter. "2 gold pieces for that," Bart told him. The man handed over the coin and picked up the block of cheese, taking it out of Adahlek's sight. Bart sees the madness grow in the man's eyes, and a twinge of fear that there might be an... incident. The door of the pub opened and in stepped the cheeky wood elf girl that he'd seen lately. Crumpling up a piece of parchment, she raises it up, ready to throw. I myself am not a big fan of cheese but Adahlek here seems upset that someone bought the cheese. I wonder who that is coming in, she is being really sneaky. Hopefully I don't get caught up in any trouble. Kodra keeps his distance, skulking in the shadows. He sizes the rider up and down. Perhaps he carries valuables? The wanderer appears to be alone, so Kodra confronts him. The man sees you and pulls his horse to a halt, looking a little stunned and concerned at the sight of a scruffy-looking bandit-like creature. "Hail.. What is it you want, Khajiit?" From the sound of his voice, and general look of him, he might be wealthy. Well-mannered, but fearful. Maybe a bit sheltered to be walking out on the road so carefree. He watches you carefully, his eyes darting now and then at the area around you, looking for a quick route of escape. Alain thought for a moment. "I've seen the dens of only a few rogue mages, but as a general rule they remain close to lakes and swamps. Makes it easier to get alchemy ingredients." He thought of a few disparaging remarks about alchemists and their swamps, but held his tongue. "We'll likely have to look for concealed entrances and trapdoors. The more capable ones build huts and cabins to draw in curious travelers, but I doubt we'll see anything like that." Though Alain spoke with confidence, he didn't dare hope the other mercenaries would take his advice. This would be a one-man job, either because most of his companions would be dead or searching miles away. Baba seemed like an alright type, so for the time being he planned to keep him close. "Just stick close to me and we'll both get out with our gold." Acedia made her way into Cheydinhal for the day. She reminded herself that despite nearly being burnt and cut into quarters by fearful peasants in her homeland, her quest to destroy Necromancers and the abominations they raise, would never waver. Making her way through the gate, she was struck by the similarities in architecture to her homeland, and felt a great pang of loss. Towards the people? Not so much. Acedia had several objectives for coming into Cheydinhal today. The first was to purchase several alchemical ingredients that couldn't be stored while she travelled. The second was to explore the city and try to find rumours of undead in the region. She did her first task easily within an hour, and spent the rest of the day exploring. "Just stick close to me and we'll both get out with our gold." Baba felt the serious tone in Alain's voice, and the carefree grin of his dropped away. In all the excitement of setting off, he'd forgotten their purpose. A grand job indeed, but all the more dangerous because of that, and he would do well to remember it, he told himself. He nodded silently and kept on the path alongside Alain, down towards The Imperial City. Mr smarter-than-he-looks Adahlek Stonesword, enraged by the premature departure of his dearly beloved block of cheese, rose from his seat, and stumbled, half crippled with rage, towards the man in the corner of the bar. Wordlessly, and without realising the pair of men on either side of the man, clutched the edge of the table, and flipped it up and over, spraying the men with their drinks and shattering the glasses as they fell to the floor. Luckily the cheese was still intact, clutched in the hand of the man. You wouldn't have flipped the table otherwise. You're smarter than you look after all. The man rose from his seat, visibly furious, drenched in foul-smelling ale, causing his dirty, brown hair to hang over his face. "By the nine, what do you think you're doing, buddy boy??" he growled. Adahlek certain was no buddy of his "Because I aint your buddy, boy." the man continued. I aint even a boy thought Adahlek. Raising the almighty finger of accusation, the man yelled across the bar "You three want to cause some trouble do you? You want to start something in here?" All of a sudden, Cirwen and Talen had been dragged into this man Adahlek's business, faced against a small gang of three. Bart Ender, evidently much too timid of a man to be working this kind of job fumbled around clumsily for words to say. The man drops the cheese on the ground, and raises a fist. He swings at Adahlek who quickly dodges out of the way. Meanwhile the other two guys get up and make after Cirwen and Talen. ((I pretty much just thought "Same setting as Oblivion, but with no Oblivion Crisis", yeah. And I guess since maps don't really matter, we can have Kvatch, and just assume that it's a basic town with all the regular fittings. We can also assume the king and his sons are all still alive. As for Werewolves I would allow it, but I don't really intend to plan for it much until it happens. If someone wants to become one I'll maybe make an event when they're attacked and fight it maybe. And I don't particularly care what you use, as long as it makes sense with your list of abilities. You can make up whatever you like; if you have illusion you can just say "I use an illusion spell that makes that dude look like a lady". Doesn't have to be a spell that you would find in the game or anything. You have free will with how your spells and attacks work. Just explain what your character is going to try and do, and I'll tell you how it goes. Your attacks can be anything. Thinking where to look first, you wonder to yourself where would be the best place for gossip about the wilderness? Travelers would know these things best, and when they arrive in Cheydinhall, where would they go? To the inn or the pub, most likely. You take to the inn, it being a more respectable establishment, with perhaps more trustworthy information. You walk into Newlands Lodge. You ask Derevera Romalen, the Dunmber publican, about sightings of undead nearby. She happily divulges the information to you. She'd heard that some Necromancers had been at work in Silver Tooth cave, and in the Ayleid ruin of Belda. Though it wasn't for sure, she'd said that there had been undead seen roaming the areas between the sites, so it seemed likely to her that a group of necromancers had maybe moved between the two at some point. Besides that, she hadn't heard any news about undead nearby, apart from the usual business involving forts. She says you might try looking at fort Horunn, near to Silver Tooth cave. 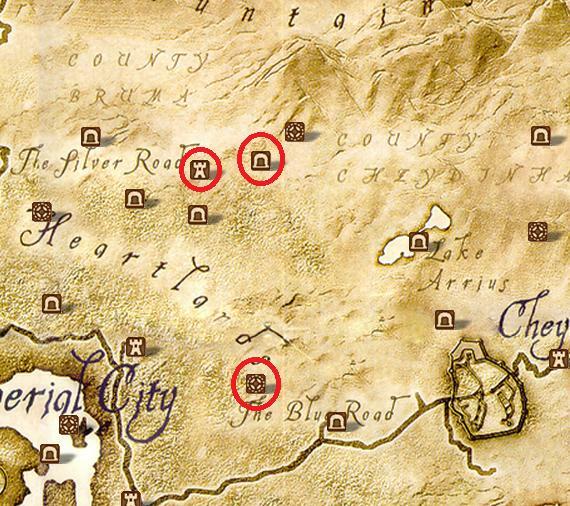 She takes down a map off her wall and points out the locations of the three. Now that you have a starting point, you wonder, what next? Shrubs, Treemo, Soggy: Still before midday, you're all in the pub. There's a caravan leaving Bruma for The Imperial City later today. Adahlek has roused up some trouble, and you're all being dragged into it. You have one fight each. Ammonsa: Early afternoon, in Cheydinhal. You've just got your information, and you're deciding what to do next. Padraig: Early afternoon or maybe morning, you're en route to Cheydinhal, quite close to the city now. You're still faced with the man on the horse, and he's starting to back away, looking to make an escape. You haven't answered him yet. Knuckle: Alain and Baba are en route to The Imperial City, and will arrive in the late afternoon. You can play around if you want while the trip is going on, but I wont have you arrive until the other characters have finished their business, so I can move them along time-wise. Kodra unsheathes his dagger and brandishes it towards the rider. "Move and I'll shoot you. Get off the horse." Kodra coolly and confidently says, without faltering. Secretly, he is somewhat worried at the possibility that the rider carries a weapon. That said, it's probably not a concern if he does: the rider does not look as if he wishes to start any fight, he looks positively terrified. Maybe he's carrying riches? After all, he is well dressed. "I'm not kidding. Get off it." The man hesitates, unsure whether or not to drop down off his horse, stand his ground, or bolt back up the road. All the confidence building he'd done in order to last this long without panicking fell through at the moment his fears were realised. The Khajiit seemed to have some kind of madness. Threatening to shoot him with a dagger if moved, and immediately requesting that he move off his horse. He stays still in his seat, confused by the request and the threat. He sighted a bow on the Khajiit's back and by the general look of him, he seemed perhaps a thief. As long as he'd known thieves, they didn't have much knowledge of swordplay and put their expertise in archery, resorting to daggers only in close combat. He wondered now why the Khajiit threatened him not with his bow, but with a dagger. The Khajiit spoke up again, commanding him to get off the horse. The rider swung a leg over and dropped down onto the road. A bit calmer now, he waits quietly for the Khajiit to move or speak again. I really didn't want get involved in this. (I use one of the few spells I know even though my class is assassin) I use paralyze on all three three guys then dart out of the tavern.